I Want 2 or More Carrots…. Tacori ring courtesy of Robbins Brothers. C’mon, my grammar’s not that bad. Although, a two-carat ring wouldn’t necessarily be the worst thing in the world…. I am referring to actual Bugs Bunny, make-your-eyes-20-20, color-your-tongue-orange carrots. And the best I have had – in my own home- came from Farm Fresh to You. I think most of LA has heard of this company- it is a family owned farm in Cali that grows veg and fruits seasonally, they also co-op with a couple of other farms in the area as well. Here’s the deal- they deliver to you a fun box of fruit and veggies to your front door before you awake from your restful slumber. It’s like Santa Claus, but a healthier version of Santa, who arrives either every week, every other week, every third week, or once monthly (your choice!). The only difference between Farm Fresh to You and Santa is that you don’t know what you’re going to get. But that’s the fun of it. 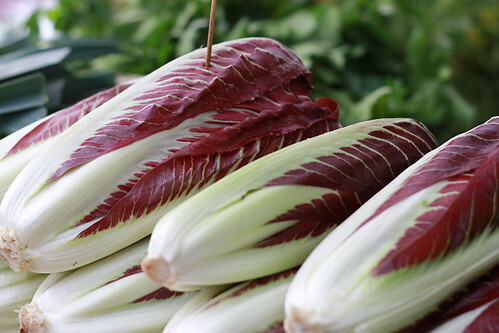 (you can also indicate what you would like NOT to get- for me, it’s radicchio. I know! It’s so good for you, but I can’t get over the flavor. If someone can teach me the trick to making radicchio taste good, please tell me, and I’ll allow it back onto my list.) Part of the genius of not knowing is that you get organic produce IN SEASON. You can select mostly fruit, mostly vegetables, large or small boxes. I get one small box every other week and that seems to work for me. It ends up being cheaper than say, a Whole Foods, a little pricier than Trader Joe’s, but you know your avocado is not from Mexico. The delivery part of this deal is especially great since I muster the energy to visit the grocery store only when a bottle of beer (belgian), a bottle of Veuve, and ketchup (organic) are left in my refrigerator. I gots my priorities in order! But the real icing on the cake… is how everything tastes. It is the sweetest Pink Lady apple that’s ever graced your lips. The carrots are crisp and hydrated and have exactly the right sweet freshness. The most recent box yielded tender asparagus stalks- and after blanching, then sautéing with olive oil, a bit of butter and a sprinkle of kosher salt… heaven. 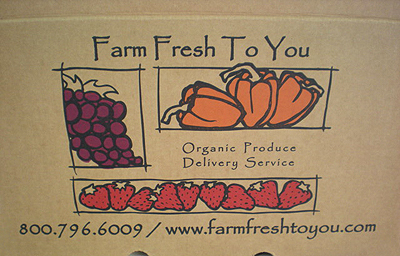 If you live in the LA area, check out www.farmfreshtoyou.com. For everyone else, Google organic produce delivery and support your local farms and your taste buds. I just started FFTY….so excited!